The complex of temples at Baalbek is located at the foot of the south-west slope of Anti-Lebanon, bordering the fertile plain of the Bekaa at an altitude of 1150 m. The city of Baalbek reached its apogee during Roman times. Its colossal constructions built over a period of more than two centuries, make it one of the most famous sanctuaries of the Roman world and a model of Imperial Roman architecture. Pilgrims thronged to the sanctuary to venerate the three deities, known under the name of the Romanized Triad of Heliopolis, an essentially Phoenician cult (Jupiter, Venus and Mercury). The importance of this amalgam of ruins of the Greco-Roman period with even more ancient vestiges of Phoenician tradition, are based on its outstanding artistic and architectural value. 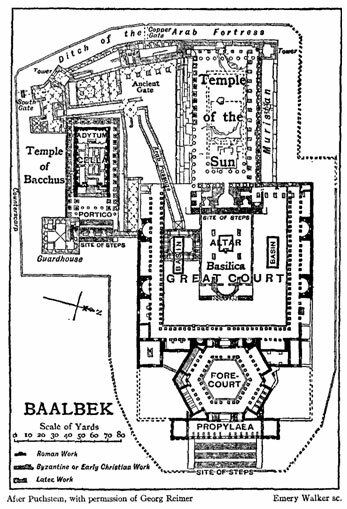 The acropolis of Baalbek comprises several temples. The Roman construction was built on top of earlier ruins which were formed into a raised plaza, formed of twenty-four monoliths, the largest weighing over 800 tons. The Temple of Jupiter, principal temple of the Baalbek triad, was remarkable for its 20 m high columns that surrounded the cella, and the gigantic stones of its terrace. The adjacent temple dedicated to Bacchus is exceptional; it is richly and abundantly decorated and of impressive dimensions with its monumental gate sculpted with Bacchic figures. The Round Temple or Temple of Venus differs in its originality of layout as well as its refinement and harmonious forms, in a city where other sanctuaries are marked by monumental structures. The only remaining vestige of the Temple of Mercury located on Cheikh Abdallah Hill, is a stairway carved from the rock. The Odeon, located south of the acropolis in a place known as Boustan el Khan, is also part of the Baalbek site, and considered among the most spectacular archaeological sites of the Near East. Baalbek became one of the most celebrated sanctuaries of the ancient world, progressively overlaid with colossal constructions, which were built during more than two centuries. 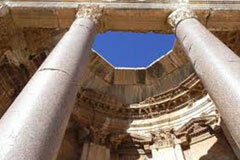 Its monumental ensemble is one of the most impressive testimonies of the Roman architecture of the imperial period. Baalbek, with its colossal structures, is a unique artistic creation and an eminent example of a sanctuary of the imperial Roman period. It is located on two historic trade routes, between the Mediterranean coast and the Syrian interior and between northern Syria and northern Palestine. Today the city, 85 km from Beirut, is an important administrative and economic center in the northern Beqaa valley. The origin of the name Baalbek is not precisely known. The Phoenician term Baal means 'lord' or 'god' and was the title given to the Semitic sky-deity. The word Baalbek may therefore mean 'God of the Beqaa valley' (the local area) or 'God of the Town', depending on different interpretations of the word. Lying on fertile plains, Baalbek was, during the Phoenician period, no more than an agricultural village where a triad of fertility gods were worshipped; given the name Heliopolis during the Hellenistic period, the modest city saw its apogee after the arrival of the Romans in Phoenicia in 64 BC, when it became one of the most celebrated sanctuaries of the ancient world, progressively overlaid with colossal constructions which were built during more than two centuries. The monumental ensemble of Heliopolis is one of the most impressive testimonies - and doubtless the most celebrated - to imperial Roman architecture. Historians attribute to Augustus the design of the imperial sanctuary where a significant religious transfer came about to the benefit of Rome. Whatever the case, the Romanized triad of Heliopolis (Jupiter, Venus and Mercury) came to replace the Phoenician triad (Baal-Shamash, Anta and Alyn). The first building work, that of the Temple of Jupiter, began during the reign of Emperor Augustus in the late 1st century BC and completed soon after AD 60 under Nero. The immense sanctuary of Jupiter Heliopolitanus was lined by 104 massive granite columns imported from Aswan and held a temple surrounded by 50 additional columns. From that time, work did not abate until the construction of the Great Altar (c. 100) and the so-called Temple of Bacchus (c. 120-25), named for the many sculptured reliefs interpreted by archaeologists as scenes from the childhood of this god. The Grand Court, construction of which began during the reign of Trajan (98-117), contained various religious buildings and altars, and was surrounded by a splendid colonnade of 128 rose granite columns. These columns are known to have been quarried in Aswan (Egypt). Today, only six columns remain standing, the rest having been destroyed by earthquakes or taken to other sites. The Temple of Venus was added at the beginning of the 3rd century. It is assumed to be a Venus temple because of its ornamentation of seashells, doves and other artistic motifs associated with the cult of this goddess. During Byzantine Christian times the temple was used as a church and dedicated to the Christian martyr St Barbara. At Baalbek-Heliopolis, the phenomenon of religious syncretism, which amalgamated the old Phoenician beliefs with the myths of the Graeco-Roman pantheon, was prolonged by an amazing stylistic metamorphosis. The Syro-Phoenician formulae of the Seleucid period were fused with the classic decorative grammar of the Ara Pacis Augustae. There resulted an architecture of a considerable expressive force which was combined, without redundancy, in the ornamental motives of the colonnades, niches and exedras and was also freely expressed in the ceilings with sculpted coffered panels and the framework of the doorways. 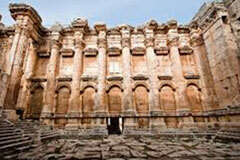 In 634, Muslim armies entered Syria and besieged Baalbek. A large mosque was built within the walls of the temple compound, which was converted into a citadel. 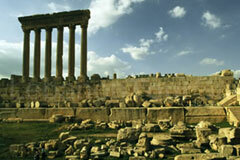 Over the next few centuries, the city and region of Baalbek were controlled by various Islamic dynasties. Its monuments suffered from theft, war and earthquakes, as well as from numerous medieval additions. This Phoenician city, where a triad of deities was worshipped, retained its religious function during Roman times, when the sanctuary of the Heliopolitan Jupiter attracted thousands of pilgrims.